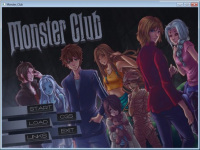 Monster Club VN is a visual novel about a group of monsters and unusual creatures staying together as a family. One of them is a human named Abraham, trying to get along with them and encountering mystical experiences and peculiar adventures. Enjoy Abraham's adventures in this short story. Save and load features are available, and it needs only mouse device to navigate through conversations. Full-length game with an atmosphere of magic and intrigue. Artificial intelligence game in the form of interactive fashion of drama.